This great economic chair meets all requirements for ease of use and comfort. Whether for camping, fishing or the BBQ, this chair is great for all occasions. NOTE: These chairs may be either Green, Blue or Black depending on supply – please let us know if a specific colour is required. Portable Folding Chair, Back Packing Broad Band Mesh Quad Durable Outdoor And Indoor Adjustable Foldable Oxford Fabric Steel Frame Slacker Chair for Camping Beach Chair Armchair Chair with Carry Bag. 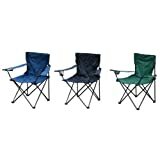 Milestone 1-Seater Folding Fishing/ Camping Chair with Cup Holder and Carry Bag "Color May Vary"
This entry was posted in Camping and Caravan Supplies and tagged Camping, chair, Folding, Kingfisher by The Camping And Caravanning Site. Bookmark the permalink.